Why Not 3D Print Your School Projects? – Make It! Create It! Learn It! Why Not 3D Print Your School Projects? Although I don’t think the bristol board will go extinct any time soon, it’s clear that 3D printing is becoming just another visual medium perfect for those school presentations. This brings back memories of when I had to sculpt all of the bones in the human foot for a Kinesiology project – a 3D printed foot would have been a dream! 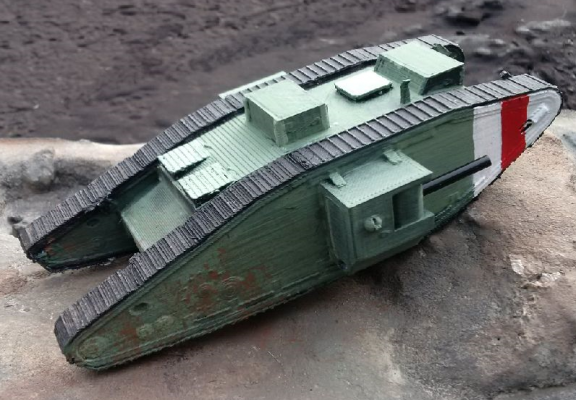 Anyways, Robert created this tank replica for his history class and I was completely awed by it! It was printed in white in 3 pieces that he glued, painted and even dirtied for effect! The detail on this is just stunning! If you have a project that needs a visual, we’re here! Book a time for staff to 3D print your item at the Make It! and Create It! spaces. Kristin is the Digital Literacies Librarian and 3D printer-whisperer. When she's not sticking her head into machines, she plays soccer, practices yoga and spends as much time as she can with her dog.